Hi friends. I have an easy and healthy recipe to share with you that does not involve any meat. 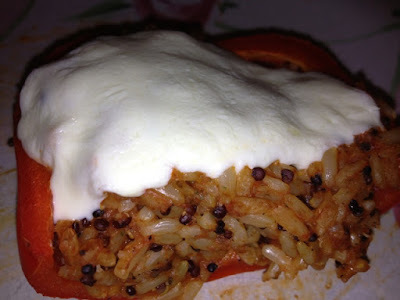 It's a stuffed pepper stuffed with rice and mozzarella cheese. This recipe is perfect for Meatless Monday. Heat oven to 350 degrees. Spray a large flat tray with Pam. Cook the rice in the microwave as the directions indicate on the package and put in a large bowl. Then add 1 can of tomato sauce and mix all together. Clean and cut the peppers in half and fill each pepper with the rice and add mozzarella on top of each pepper. Put in the oven with tin foil on top for 15 minutes and when 15 minutes are up take off the tin foil and put back in oven for another 15 minutes. You will be cooking in the oven for a total of 30 minutes until the peppers are done. You can tell when the peppers are done when you stick a fork in the middle of the pepper and the fork slides in easy. ** For this recipe I bought the Seeds of Change - Quinoa & Brown Rice with Garlic at Costco. I hope you all enjoy this easy and delicious meal for a week night dinner. We would love your Stuffed Pepper's! Thanks so much for sharing with Full Plate Thursday and come back soon!